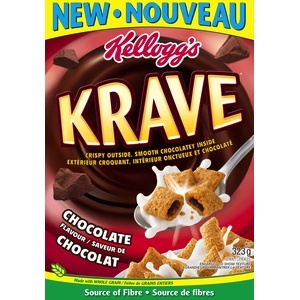 On Checkout 51’s list this week (Sept 12-18, 2013) is Kellogg’s Krave* Cereal, Any variety. More chocolatey cravings? Feed the urge with NEW Kellogg’s Krave* Double Chocolate flavour. It’s got a crisp chocolatey outside, with a devilishly smooth chocolatey inside. You will get $1.00 cashback rebate at Checkout 51. Here’s a pic of what it looks like. I found a couple prices of it at a few stores. I didn’t find any Kellogg’s Krave Cereal coupons to use.